District 12 meetings are held on the 2nd Tuesday of the month at 8:00PM. Welcome to Louisiana’s District 12 where you can find information on AA meeting schedules, events, hotline numbers and links to other AA websites. 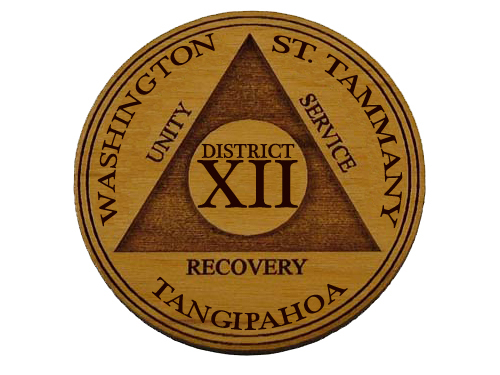 District 12 has but one purpose; to serve the fellowship of Alcoholics Anonymous in St. Tammany, Tangipahoa and Washington Parishes in promoting the message of Recovery, Unity and Service to its Groups.